"My goal is to enrich people’s lives through anatomically correct movement. I have an unrelenting mission to find the root cause of movement dysfunction, which has led me to deeply study scoliosis research. 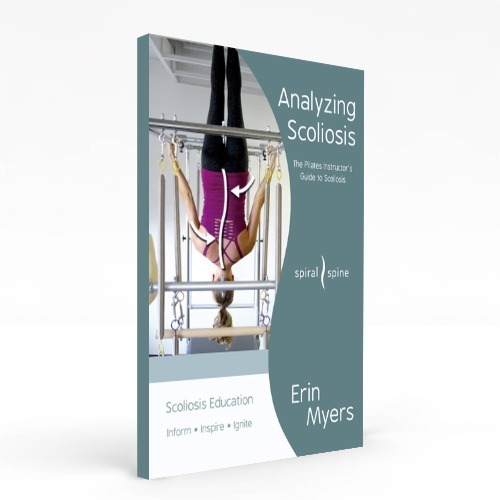 I combine my findings with my vast knowledge of movement and a light-hearted and accessible teaching style to help those diagnosed with scoliosis, their parents, and their entire tribe." Hi there! I came to Pilates hoping for relief from both the pain of my scoliosis diagnosis and the physical demands of my dancing profession. At the height of my career as a Radio City Rockette, I found I hated dancing because of the severe pain and injuries my body sustained. I began to understand more about my body and discovered that the movement of Pilates led to healing and massive pain relief. Helping others live a quality, pain-free life became my passion. I have found that my clients gain confidence, develop an improved body image, and experience better relationships as they practice Pilates. I get great fulfillment from walking this journey with clients. I want to shout from the rooftops that you don't have to live in pain! Your life can be different; it can be amazing! I never intended to pursue scoliosis work. At my first Pilates studio, a mother brought her young daughter to me in search of help for her scoliosis. Armed with good Pilates training, but no specialized scoliosis knowledge, I was able to decrease the curvature of her spine within our first year of working together. The floodgates opened and light bulbs went off. This was the work planned out for me. More clients with scoliosis began to come to me, and I dove headfirst into every bit of research and training I could find. I've read hundreds of scoliosis research articles, have attended countless scoliosis workshops, and am constantly doing continuing movement education. I am constantly writing scripts for video workouts and training videos. My journals overflow with notes that will be in future books and publications. Doctors of all types throughout Nashville send their scoliosis patients to me for relief and improved symptoms. I've created books, apps, at-home workout videos, and online workshops to support this important work and ministry. I've achieved the highest level of dancing with my own scoliotic body. I am proof that you can live a pain-free, joyful life. You can be strong and "normal" in all aspects of your life. My deep desire is to teach people to "own" their bodies. I want them to understand why their body acts in a certain way. When I teach them the "why" and give them practical steps to improve their quality of life, the emotions they have boiling up inside fade away. They are no longer ruled by fear, anger, sadness, shame, and loneliness. My unrelenting mission to find the root cause of movement dysfunction combined with a light-hearted and understandable teaching style draws in devoted clients young and old. My favorite things include a lovely cup of tea, a beautiful beach, my well-worn Bible, and piles of reading and research on the human body. I worship the Creator as I teach, and I am continually learning about His most amazing masterpiece–us. Humans. I stand in awe of how beautifully knit together we each are, and I have an unquenchable thirst to understand Truth and share it with others so that they may have the same freedom I have found. I have the most amazing husband in the world, Aaron, and we have two rambunctious boys, Levi and Asher. Our family has a lot of moving parts, but we enjoy the journey together. We study hard, eat pure food, sleep deeply, are active outside, and love on each other well.